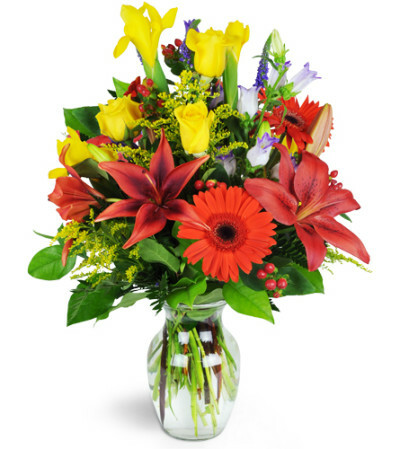 When celebration is in the air, our Fires of Autumn™ bouquet sets the tone with warm red gerbera daisies, red lilies, yellow roses and irises, and purple veronica stems. Lush with happy harvest colors and rich scents, this floral statement is a feast for the senses. 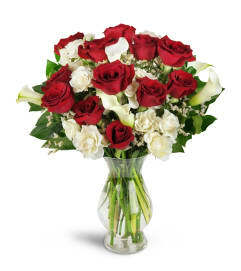 Perfect for birthdays, thank you sentiments, and when congratulations are in order. 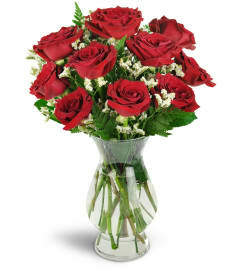 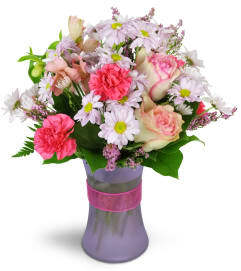 Roses, lilies, Gerbera daisies, and so much more are arranged in a classic clear glass vase.